I love the television series but, quite frankly, I cannot believe there are so many incompetent and ineffectual parents out there. As Jo says, it's common sense - something I firmly believe is lacking in certain parts of the world these days. My mouth hangs open when I watch how parents fail to discipline their kids or spend time with them or speak decently to them. What baffles me is why people who are clueless, have any children, and why are people still having so many children when they seemingly don't know the first thing about raising their offspring? Life's tough enough without having to put your children through more struggles than necessary. 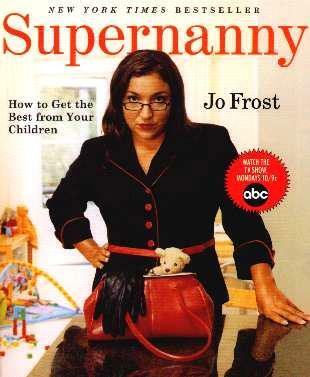 Jo Frost, the cockney Londoner, who needs a few elocution lessons herself, is spot on with her steps to being better parents and bringing up respectful and well-mannered children. I agree that kids need boundaries and discipline and explanations, just three of her top ten rules. Every potential parent should be made to watch a couple of Jo's programs - get an idea of what's ahead. Her book takes parents from the birth of a new baby to the five-year old and through the learning years, through tantrums and toilet training, how to talk to your child, and the famous "naughty step" technique. The other thing that alarmed me was the junk kids are fed - what happened to a mother (or father) preparing a decent and nutritious meal for their children? If you don't have the time, why have kids? That's just my opinion. Jo's rules are clearly laid out and make so much sense. Conclusion - Oh, this is a huge MUST-READ for all parents!